It’s another early start and I’m up and out before the sun is fully wide awake. I do another sneaky 5km and track my progress on my amazing little ASICS app. My speed is the same as before, so I’m consistent if nothing else! 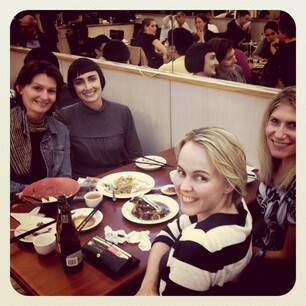 The day flies by and after work, me, Pip, Emily and Jitka have a girlie get together. It’s probably been more than a year since the four of us have been in the same place at the same time to catch up, so this is a real treat! Jane joins us for a quick drink first which is a real value added bonus, but before, we know it, the four of us are on our way to dumpling heaven. 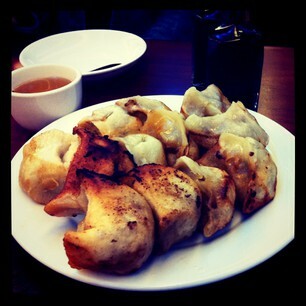 If you are what you eat, then I should be a chinese dumpling! And that’s the truth! I swear I could eat them for breakfast, lunch and supper, and afternoon tea for that matter, and never get bored of them. I just love every last morsel! Emily is the font of all knowledge when it comes to Chinese food in Sydney so I’m sure tonight’s supper will be second to none! We’re off to Seabay – home to the best dumplings in town! The restaurant looks more like a cafe than a smart restaurant but don’t be decieved the dishes are delicious! We plump for the fried dumpling to start (Emily knows best,) and they are so yummy I could eat them all by myself, should the need arise. Unfortunately it doesn’t. For mains, Jitka and I opt for wonton soup. Short of getting another plate of dumplings for my main, this seems the safest and healthiest option to satisfy my ongoing dumpling craving! It’s fresh and really tasty with big chunks of chicken and wonderful wontons! Everyone has such a stuffed stomach that there’s a whole heap of waistband extending going on! There’s lots to catch up on but we can hardly hear ourselves for the fog horn lady sitting behind us. Her voice obviously has a faulty volume control because she can only shout or holler. Add her two out of control children into the mix and it’s a recipe for disaster, or at least, a headache. The restaurant is packed and full of chat, but even so, we can hear every word she says. It’s deafening not to mention annoying! In the end we figure if we can’t beat her, we might aswell join her, so we break the sound barrier in an effort to make ourselves heard! So we leave with big bellies, sore throats and exhausted eardrums! Back at the ranch, I just have time to get myself organised and then off to bed. It’s my first personal training session for what seems like forever, and I want to be ready and raring to go! Bring it on!